Last week I was treated to a day of paintings conservation. I’m actually trained as an objects conservator, which means that I am qualified to work on almost anything EXCEPT paintings. In truth, there are many things that I have little to no expertise conserving, including architecture, paper and photographs, digital media, and so on. I have, however, worked on a variety of strange and wonderful objects ranging from shipwreck nails to stone sculpture to broken natural history specimens. Most objects conservators thrive on variety. There is no paintings conservator on staff at the Royal BC Museum, mainly owing to the fact that we have a comparatively small collection of paintings. When there is paintings conservation work to be done, a highly respected and dependable local contract conservator does the work for us. 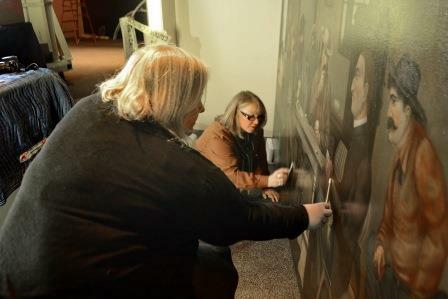 The recent work was in preparation for our upcoming Gold Rush exhibition, due to open on May 13th. We plan to display a very large painting, affectionately nicknamed “Slim Jim”, but actually titled “The Parson Takes the Pot”, created by Rowland Lee, which measures almost 2 x 3 meters (much larger if you include its very ornate frame!). The logistics of moving, hanging, and protecting such a large picture is another story. At this point in time, it was felt that the varnish on the painting had yellowed and turned a bit milky over the years, obscuring the vibrant colours of the paint beneath. 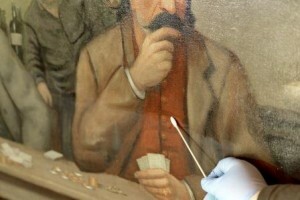 Investigation by the paintings conservator concluded that the varnish had not discoloured, but was actually a modern varnish applied in 1978 by the Canadian Conservation Institute in Ottawa. The problem was actually a layer of dust and nicotine adhering to the surface. Sometime between 1978 and now, the painting was hung in the office of a smoker. That will do it! Our contract conservator had little time to spend on the painting, and the exhibition deadline is looming, so I offered to work alongside the paintings conservator, using the hand skills I learned while working on objects, and taking direction from the expert. This way we could finish the cleaning in half the time. It worked out wonderfully. The layer of dust and nicotine was removed with a gentle solvent applied by cotton swab, and rinsed with distilled water. The difference was immediately obvious, as the colours burst forth under our swabs and the actual extent of masking became evident. This is something every conservator appreciates; strikingly different before and after treatment photographs. After only about 6 hours of tandem cleaning, the painting now literally shines and the depth of colour is gratifying. My first foray into paintings conservation was a success! RBCM Conservator Kasey Lee in the background. Contract conservator in the foreground. The upper area has been cleaned.